Enjoy A Day of Beauty and Pampering! No one can say no to a day of pampering. If you will be staying in any of the hotels close to San Jose, CA why not treat yourself to a day of fashion, beauty, and cocktails? 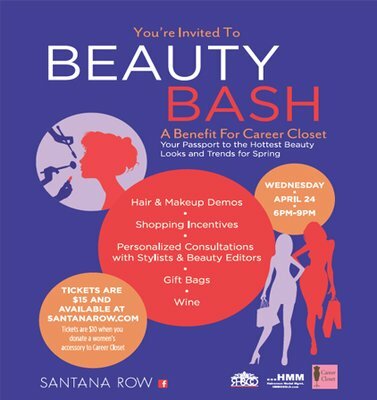 Santana Row will be hosting the first ever Beauty Bash: A Benefit for Career Closet. The benefit will be taking place in the Santana Row shopping complex and all are welcome! At the event, you will have the opportunity to interact with salon professionals, beauty experts, and stylists who will personalize their services for each individual guest. Try on the latest fashion, all while having a stylist tell you what new trends fit your shape and personality. Guests will also be able to view the latest hair and makeup trends. Beauty experts will give personal consultations on how these looks will work best for you. To complete your new fashion expertise, Halvorson Model Management will be sending over models to teach you how to smile in front of the camera just like a professional! Wine and cocktails will be served throughout the event and light snacks will be provided. Attendees will also receive a free goodie bag. All this just in time for spring! Need more of a reason to attend the event? Career Closet is an organization that helps disadvantaged women prepare for job interviews by providing professional clothing and offering useful advice. All proceeds raised from this event will go directly to Career Closet. So come get pampered knowing you are helping a great cause! Beauty Bash is your passport to the hottest trends for spring. Previous PostGet Filthy at Kiss Me Dirty!Next PostPush Yourself To the Limit at Gladiator Rock Run!